He apprenticed under Pini Gershon before earning the reins as head coach of his beloved team. During a four-year stint on the sidelines, he guided the club to the Turkish Airlines EuroLeague Championship Game twice. Now he has resettled with a another famous club on the warm shores of the Mediterranean. After suffering a blowout loss last week, tonight he will face some of the players he led to greatness not long ago. The description above fits both Olympiacos Piraeus head coach David Blatt and his Maccabi FOX Tel Aviv counterpart Ioannis Sfairopoulos, whose teams square off tonight in the Turkish Airlines EuroLeague Game of the Week for Round 22. And now each sits on the bench that the other so recently occupied. Blatt was an assistant to Gershon at Maccabi for three seasons and became a EuroLeague champion in the last of those. He spent two seasons as Maccabi's head coach, from 2001 through 2003, then returned to the head of the bench in 2010. In that second stint, Blatt guided Maccabi to the 2011 EuroLeague title game and won the crown in 2014. He then crossed the ocean and led Cleveland to the NBA Finals before returning to Europe and winning the 7DAYS EuroCup with Darussafaka Istanbul. He will coach tonight against four players he knows well. Jeremy Pargo earned All-EuroLeague honors under Blatt in 2011; Scottie Wilbekin was the EuroCup MVP under him last season; Alex Tyus won the EuroLeague with Blatt in 2014; and Jake Cohen made his EuroLeague debut under Blatt in 2013. Sfairopoulos, meanwhile, served as Gershon's assistant for two seasons when the latter came to Olympiacos in 2006. He came back as the Reds' head coach shortly after the 2014-15 season began and promptly led the team to the EuroLeague championship game, a feat he repeated two years later. Both times Olympiacos lost to a team playing in its own city; Real Madrid in 2015 and Fenerbahce Istanbul in 2017. Sfairopoulos left Olympiacos at the end of last season and joined Maccabi in mid-November. 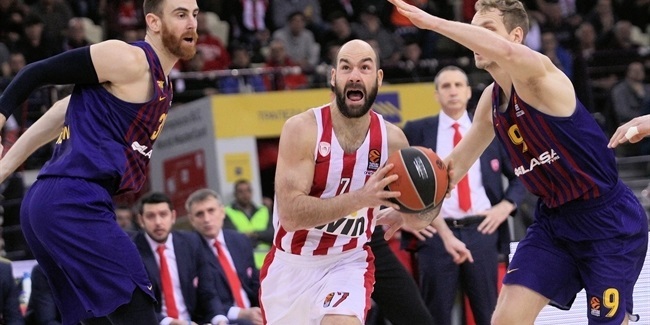 He will coach tonight against as many as eight players he knows well: Vassilis Spanoulis was named to the All-EuroLeague team twice and Georgios Printezis once under Sfairopoulos. That duo was joined by Vangelis Mantzaris and Dimitris Agravanis in playing all four seasons that Sfairopoulos spent with Olympiacos. Kostas Papanikolaou and Nikola Milutinov played in three of those seasons and Janis Strelnieks and Georgios Bogris joined the Reds last season. 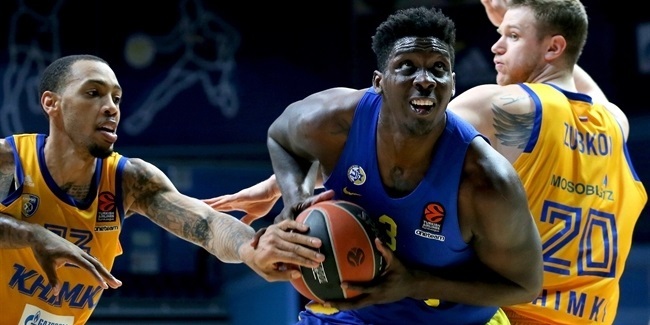 One big difference between them this season is that while Blatt signed in the summer and had a hand in how his current squad looks, Sfairopoulos joined Maccabi in mid-November and inherited a complete roster that he has not made any changes to. There have been many similarities between the results these respected coaches have achieved this season. Olympiacos won six of seven at one point and has been around fourth and fifth place in the standings for much of the season. After falling at Fenerbahce two weeks ago and getting thumped by FC Barcelona Lassa at home last week, the Reds are in sixth place, with the same record as fifth-placed Barcelona, 12-9. Maccabi had won four in a row to get back into the playoff hunt before getting spanked by KIROLBET Baskonia Vitoria-Gasteiz last week and is now 10th at 9-12. That brings us to today. This Round 22 clash is one that neither team can afford to lose. A three-game losing streak now for Olympiacos on the eve of its trip to third-place Anadolu Efes Istanbul would critically damage its chances of securing home-court advantage for the playoffs. With ninth-place AX Armani Exchange Olimpia Milan hosting last-place Darussafaka, a Maccabi loss would see it fall at least two wins outside the playoff zone before its Round 23 visit to the Italian champs. The game promises to be a tactical duel, with Blatt and Sfairopoulos both enjoying specific insights into how to slow down some of the other's top weapons. 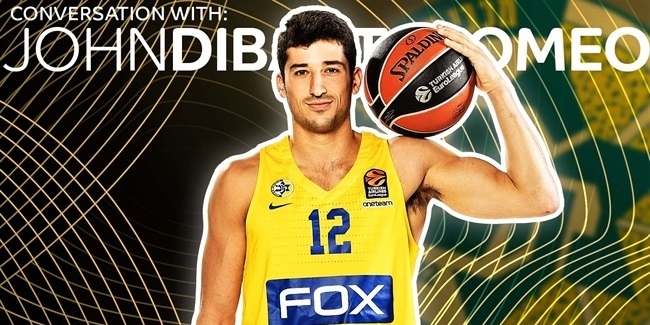 It will be a first-time face-off between them this season, too, since Sfairopoulos was not yet with Maccabi when the two teams met back in Round 4. Whether Olympiacos will be at full strength is a question. Milutinov, Papanikolaou and Printezis are all nursing injuries, but all made the trip to Tel Aviv for such an important game. New signing Briante Weber will not debut just yet for the Reds, however. Milutinov leads Olympiacos in scoring, rebounding, blocks and performance index rating, so one key to the game may be how Bogris and Zach LeDay – who knows a thing or two about playing at Menorah Mivtachim Arena after having made his professional debut last season in Israel with Hapoel Galil Gilboa – handle Maccabi big men Johnny O'Bryant and Tarik Black. Maccabi will be at full strength for the game. This game has all the trappings of a classic: The coaches know each other and the opponent well. The teams are stocked with talent. The arena will be full and loud. The game is of great importance to both teams. It's everything you could hope for in a February showdown.